Some Tachinid Flies are known to be host species-specific while some other species will use hosts in 2 or 3 different insect orders. Many Tachinid Flies are parasites of important pests of agricultural crops or forest trees. Some of them are used as parasitoids in integrated control programs. A small number of species have successfully been used as biological control agents. However, some Tachinid Flies are not always so obliging and many attempts at biological control using Tachinid Flies have failed. Instead of the target pest, the Tachinid Fly attacked some other unexpected targets. Tachinid flies use different methods to find their hosts. Some species find their hosts by searching on the their food plants. A species which parasites on mole cricket, the females are found to be attracted to songs produced by those crickets. 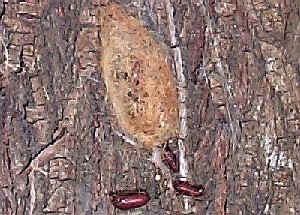 Some species stick eggs directly on the host. Some species deposit eggs on foliage of host food plants to be ingested by the host as it feeds. 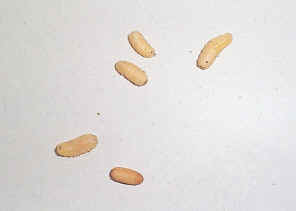 Some species lay their eggs their hosts, when hatch, those larvae move towards their host and get into their body through the soft part of the host skin. Females of some other species that attack bugs and adult beetles have piercing ovipositors that insert their eggs into the body of their hosts. Some species, instead of laying eggs, they lay live larvae and apply them onto the host using either one of the about methods. In the early stages, the Tachinid Fly larvae will not kill the hosts. They feed on non-essential tissues and grow with the hosts. The hosts continue to live normally. Later the Tachinid Fly larvae begin to feed on essential tissues and kill the host. 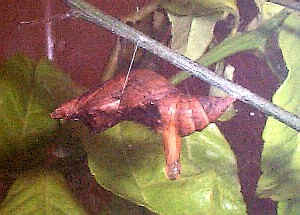 If the host is a moths or butterfly caterpillar, it usually being killed in pupa stage. 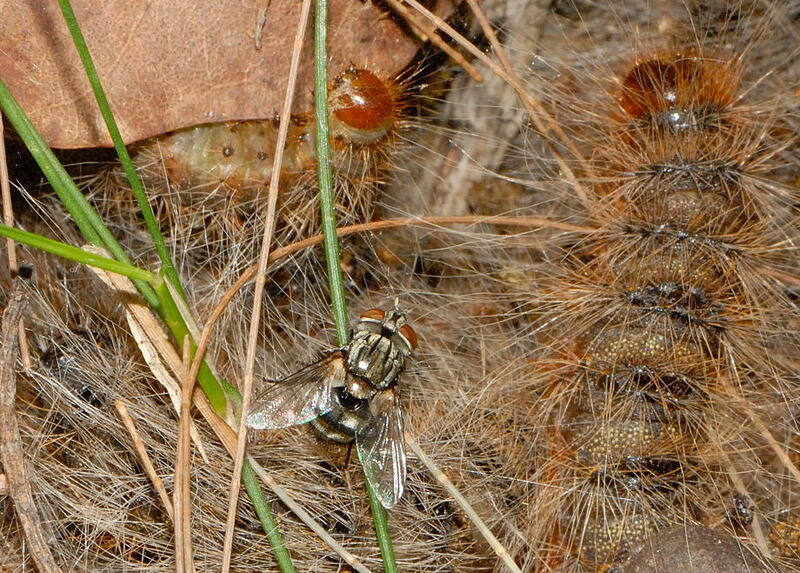 The Tachinid Fly larvae may come out from the hosts to turn into pupae, or some species pupate inside the dead hosts. 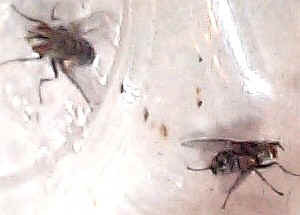 One to two weeks later, the adult Tachinid Flies emerge, mate and look for the next host. The cycle start all over again. Tachinid fly is generally regarded as a relatively recent, actively evolving family. 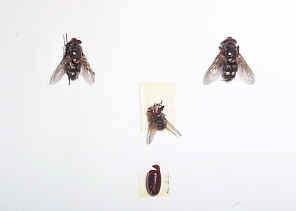 For their hosts, there is not many, if any, noticeable solution evolved to against the Tachinid Fly parasite. The hair of the hairy caterpillar could be evolved to again the flies lay eggs on their body. Beside this, we do not see any other ways evolved to again the parasite. We had many experience with moths/butterfly parasite Tachinid fly. We had raised many moths and butterflies from caterpillars. Quite a high percentage that we end up seeing some flies instead of moths/butterflies from the pupa. For the butterfly caterpillars we collected so far, all species are subjected to the parasitise by Tachinid Flies. For some species, we never success in raising an adult butterfly. All end up seeing the fly larvae emerged from the butterfly pupa. Details please see the following sections. The parasite infection rate seems very high. One reason could be if the caterpillar can easily by found by us. They are easily found by the Tachinid Flies too. If one caterpillar were infected, all others in the same location could be infected as well. When we were looking for the Wanderer Butterfly caterpillars in the bush, we can see quite a number of Tachnid flies flying around the milkweed plants, which is the host plants of Wanderer Butterfly. Those Tachnid flies have the same target as we were, looking for the caterpillars. We collected this fly when we were breeding the Wanderer Butterfly. 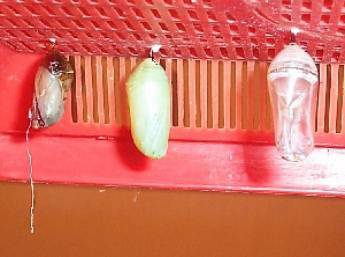 The second picture shows, from left to right, a black dead pupa, a green pupa which will turn into a butterfly some days later, and an empty pupa that the butterfly has already emerged from. 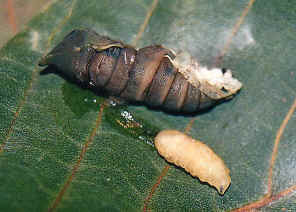 The dead pupa was killed by the Tachnid fly larva. A larva, white in colour with black head, 5mm length, come out from the Wanderer pupa and then turned into a small pupa (the empty pupa can still be seen in the picture, 5mm in length). 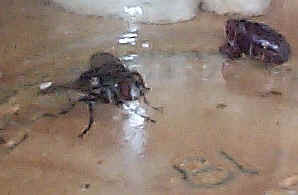 After a week, it turned into this fly (first picture). 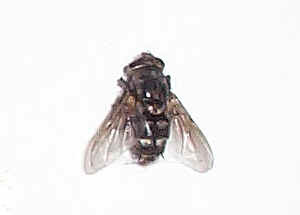 The Tachnid fly are 8mm in length and are brown, grey and black in colour. We collected those Tachnid flies when we were breeding Common Crow Butterflies. We had collected three large(0ver 20mm) and two small(10mm) caterpillars. None of them turn into butterflies. Only one caterpillar turn into pupa but one day later four Tachnid fly larvae came out from it. All the other caterpillars had no chance to turn into pupa yet. They were killed by the Tachnid fly larvae in their last instars stage. In average there were there to four Tachnid fly larvae emerged from each caterpillar. The Tachnid fly larvae, pupa and adults were all look the same as the Tachnid flies come out from the Wanderer Butterfly pupa. When the Tachnid fly larvae come out, they try to hide in the leaf litter. They turn into pupa within a few hours. 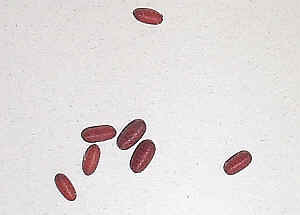 The pupa was brown in colour and turn into dark brown to black after a few days. 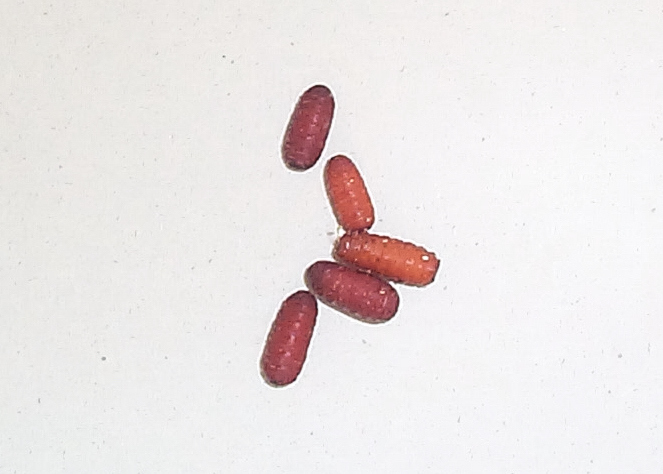 A week later, Tachnid fly came out from each pupa. We have breed totally 12 Orchard Butterfly caterpillars. We breed two to three caterpillars each time, starting from the early summer season. We found the caterpillars on two different Citrus trees in the bush of Wishart. It turned out that all Orchard Butterfly caterpillars are being parasite by the Tachinid Fly and none of them turn into butterflies. Within the 12 caterpillars we found, there were the large one (over 20 mm) and small one (10 mm). They all turn into pupa, but after three to four days, all emerged with the Tachinid Fly Larvae. There were three to five larvae came out from each pupa. On the trees that we found those Orchard Butterfly caterpillars, we do found four pupa. We checked that two were killed by Tachinid Fly Larvae and the other two turned into butterflies. This shows that some of the caterpillars still have the chance to become butterflies. But we cannot explain why 100% of the caterpillars we breed were killed. The Tachinid Fly Larvae were 10-12 mm in length, white to creamy white in colour. A few hours later they turned into brown pupa. The Tachinid Flies were larger that those we found from the Wanderer and Common Crow (details see above). The Tachinid Fly Larvae were 10-12 mm in length, white to creamy white in colour. A few hours later they turned into brown pupa. 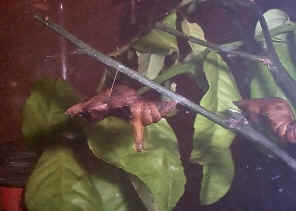 The pupa turn into dark brown and then black colour a few days later. 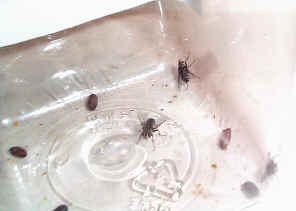 About a week later, the Tachinid Flies come out. They are grey in colour with dark red eyes. Their body is hairy. We found that Blue Triangle Butterflies are also suffered the parasitise by Tachinid Fly. The about picture shows a fly larvae just emerged from a Blue Triangle pupa. We collected three large Blue Triangle caterpillars and found later all are infected. We took this picture on a tree trunk. There was the brownish-yellow silk cocoon, which look like a moth cocoon. There were four holes on the silk cocoon. Below there were three empty pupae, 5mm in size, look like they were left by the Tachinid Flies. The picture suggested moths are also the host of Tachinid Flies.